Another ‘dinosaur-bird link’ falls flat. The latest ‘missing link’ is described by Dr Fernando Novas in the 22 May 1997 issue of Nature.2 It is based on more than 20 fragments of leg, rib and shoulder bones found in the Patagonia region of Argentina. From these, artists have drawn a silhouette of a creature (Unenlagia comahuensis) with neck, head, jaws, tail etc.—1.2 metres (four feet) tall at the hip and c.2.3 metres long. They claim it was carnivorous. Its pelvis is said to resemble both birds and theropod dinosaurs. But the main evidence for its intermediate status is its shoulder girdle, which was tilted outwards in a way which supposedly could have enabled flightless flapping. Actually, Dr Novas admits that this creature could not have been a ‘missing link’—since he believes it to be 55 million years younger than Archaeopteryx, a true perching bird with real flight feathers.7 Obviously an ancestor cannot be millions of years younger than its descendant! But he claims this is what the link must have resembled. Once again, it is likely that there will be a deafening silence from the secular media when this latest ‘evidence’ for evolution joins the long list of items which are no longer believed by evolutionists themselves. See—Life on Mars?, Creation 19(1):18–20, December 1996; Kentucky fried dinosaur?, 19(2):6 & 8, March 1997; 19(3):6 & 7, June 1997. See also—Q&A: Alien Life/UFOs. F. E. Novas and P. F. Puerta, New evidence concerning avian origins from the Late Cretaceous of Patagonia, Nature 387(6631): 390–392, 1997; commentary in the same issue by L. M. Witmer, A New Missing Link on pp. 349–350. A. Perle et al, Flightless bird from the Cretaceous of Mongolia, Nature 362:623–626, 1993; correction of the name to Mononykus, as Perle et al.’s choice Mononychus was already taken, Nature 363:188, 1993. 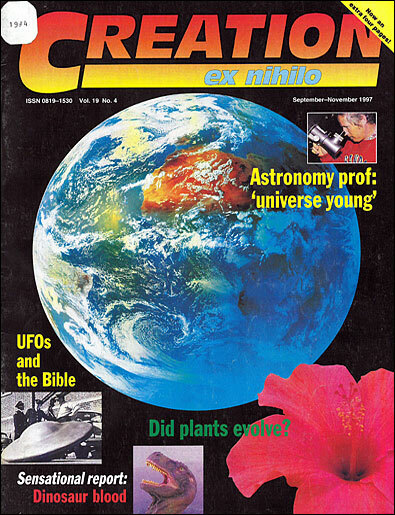 Time (Australia), 26 April 1993. R. Monastersky, A clawed wonder unearthed in Mongolia, Science News 143(16):245, 1993; Creation 15(4):7, 1993. John H. Ostrom, On the origin of birds and of avian flight, in Major features of vertebrate evolution, ed. D. P. Prothero and R. M. Schoch, pp. 160–177, University of Tennessee Press, 1994. Alan Feduccia, Evidence from Claw Geometry Indicating Arboreal Habits of Archaeopteryx, Science 259:790–793, 1993. Quoted in Ann Gibbons, New Feathered Fossil Brings Dinosaurs and Birds Closer, Science 274:720–721, 1996. Quoted in Pat Shipman, Birds do it … did dinosaurs, New Scientist 153(2067):27–31. See Michael Denton, Evolution: a Theory in Crisis, Adler & Adler, Bethesda, Maryland, pp. 199–213, 1985. A.H. Brush, ‘On the origin of feathers,’ Journal of Evolutionary Biology 9:131–142, 1996.